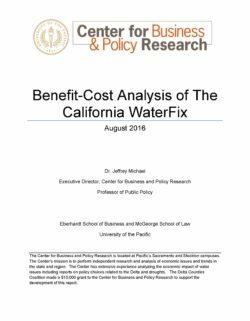 This benefit - cost analysis of the California Water Fix was prepared by Dr. Jeffrey Micheal with the University of the Pacific Center for Business and Policy Research; Dr. Michael is an opponent of the project. He writes, "This analysis is based on data and assumptions in the revised environmental documents produced by DWR to support the proposal’s environmental review. The results show the WaterFix costs are four times larger than its benefits, and thus the project is not is not economically justified." • Endangered Southern Resident killer whales ( Orcinus area). • Southern DPS of North American green sturgeon. Southern Resident killer whales critical habitat is outside of the action area. As required by section 7 of the ESA, for the above species, NMFS has included an incidental take statement for activities within the proposed Project that do not require further analysis. The incidental take statement describes reasonable and prudent measures NMFS considers necessary or appropriate to minimize the impact of incidental take associated with these activities. The take statement also sets forth nondiscretionary terms and conditions, including monitoring and reporting requirements, that the U.S. Bureau of Reclamation (Reclamation) as the Federal action agency, must comply with to carry out the reasonable and prudent measures. Incidental take from activities that meet these terms and conditions will be exempt from the ESA’s prohibition against the take of listed species. The Project for this consultation is a “mixed programmatic action” because it approves some actions that are not subject to further section 7 consultation as well as provides programmatic review of future actions that would be authorized, at a later time. For actions that are expected to be developed in the future (mitigation/restoration, monitoring, adaptive management), take of listed species would not occur until those future actions were authorized. For other actions (construction and operations), NMFS is providing an incidental take statement with this Opinion. 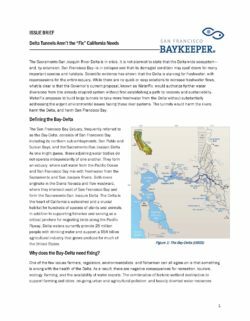 The enclosed Opinion is based on information provided in the Reclamation’s transmittal letter and biological assessment, correspondence and discussions between NMFS, Reclamation, and California Department of Water Resources staff, and consultants; a final proposed action issued on June 2, 2017; comments received from Reclamation; peer review reports from the Delta Stewardship Council’s Delta Science Program; and an extensive literature review completed by NMFS staff. 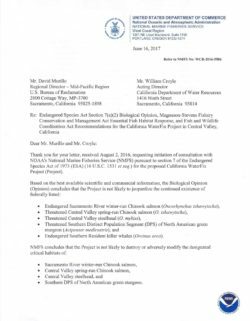 A complete administrative record of this consultation is on file at the NMFS California Central Valley Office. NMFS also concurs with Reclamation’s conclusion that the proposed action is not likely to adversely affect threatened Central California Coast steelhead (O. mykiss), endangered Central California Coast coho salmon (O. kisutch), or the designated critical habitat for Central California Coast steelhead. Designated critical habitat for Central California Coast coho salmon is not included in the action area. NMFS reviewed the likely effects of the proposed action on essential fish habitat (EFH), pursuant to section 305(b) of the Magnuson-Stevens Fishery Conservation and Management Act (MSA) (16 U.S.C. 1855(b)), and concluded that the Project would adversely affect the EFH of Pacific Coast salmon, Coastal Pelagic species, and Pacific Coast Groundfish in the action area. We have included these EFH consultation results in Section 3 of this document. The EFH consultation itself includes Conservation Recommendations specific to the adverse effects to EFH identified during our review. Reclamation has a statutory requirement under section 305(b)(4)(B) of the MSA to submit a detailed written response to NMFS within 30 days of receipt of these EFH conservation recommendations, and 10 days in advance of any final approval of the action if the response is inconsistent with any of NMFS’ EFH Conservation Recommendations. The written response must include a description of measures adopted by Reclamation for avoiding, minimizing, or mitigating the impact of the Project on EFH (50 CFR § 600.920(k)). If unable to complete a final response within 30 days, Reclamation should provide an interim written response within 30 days before submitting its final response. In the case of a response that is inconsistent with our recommendations, Reclamation must explain its reasons for not following the recommendations, including the scientific justification for any disagreements with NMFS over the anticipated effects of the Project and the measures needed to avoid, minimize, or mitigate (also referred to by NMFS as measures that "offset") such effects. This consultation examines whether the California WaterFix (CWF) Proposed Action (PA) is likely to jeopardize the continued existence of the threatened California red-legged frog (Rana draytonii), threatened California tiger salamander (Central California Distinct Population Segment; Ambystoma californiense), threatened delta smelt (Hypomesus transpacificus), threatened giant garter snake (Thamnophis gigas\ endangered Least bell's vireo (Vireo belliipusillus), endangered San Joaquin kit fox (Vulpes macrotis mutica), threatened valley elderberry longhorn beetle (Desmocerus californicus dimorphus), threatened vernal pool fairy shrimp (Branchinecta lynchi), endangered vernal pool tadpole shrimp (Lepidurus packardi), and threatened western yellow-billed cuckoo (Coccyzus americanus occidentalis). Additionally, this consultation addresses whether the CWF PA is likely to destroy or adversely modify delta smelt critical habitat. The attached Final BiOp incorporates relevant information provided by the action agencies and applicant, including comments, changes, and additions to the CWF provided since consultation was initiated. The Service has prepared a mixed programmatic BiOp on the CWF. This BiOp represents the culmination of consultation on a mix of standard-level and programmatic-level project elements. An analysis and conclusion of whether or not the entire CWF action is likely to jeopardize each listed species or destroy or adversely modify designated critical habitat is included in this BiOp. All activities addressed programmatically will be subject to a subsequent consultation on future Federal actions in order to proceed. The following activities analyzed as a standard consultation are: (1) construction of the tunnels; (2) expansions and other modifications of Clifton Court Forebay; (3) associated infrastructure; (4) geotechnical explorations, (5) compensatory mitigation associated with construction except the North Delta Diversions (NDD), Head of Old River Gate (HORG), and Contra Costa Water District (CCWD) settlement agreement facilities; and (6) specific construction-related conservation measures including preconstruction surveys for listed terrestrial species. Where incidental take of threatened or endangered species is reasonably certain to occur, an Incidental Take Statement for these activities is included with this BiOp. The following activities requiring future Federal approvals and therefore addressed programmatically are: (1) construction of the NDD and associated structures; (2) construction of the HORG; (3) construction of the CCWD settlement agreement facilities; (4) operations of new and existing CVP and SWP water facilities under dual conveyance; (5) future maintenance; (5) future monitoring; (6) compensatory mitigation associated with construction of the NDD, HORG, and CCWD settlement agreement facilities; and (7) the CWF Adaptive Management Program. In order to ensure that future actions developed for the CWF are consistent with this analysis, Reclamation and DWR have proposed a framework consisting of Guiding Principles that are analyzed as part of this BiOp. One or more subsequent consultations will be needed to address activities associated with future approvals. No Incidental Take Statement is included for activities addressed programmatically because those subsequent consultations will address incidental take associated with those activities. The Service has analyzed the operational scenario for CWF included in the BA. The agencies recognize this operational scenario will change between now and the time that the CWF facilities are operational. Changes to the operational scenario will be analyzed in subsequent consultation. 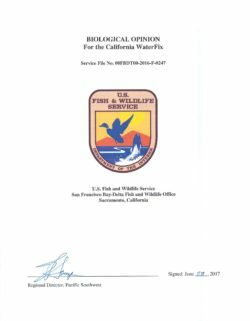 The attached BiOp addresses effects of the CWF to 16 federally-listed species and designated critical habitat. Appendix A of the BiOp includes justifications for the species and critical habitat that were determined not likely to be adversely affected. Effects to the remainder of the species and critical habitat are addressed in the BiOp. The Service has determined that the CWF is not likely to jeopardize the continued existence of any of these species, and is not likely to destroy or adversely modify designated critical habitat. 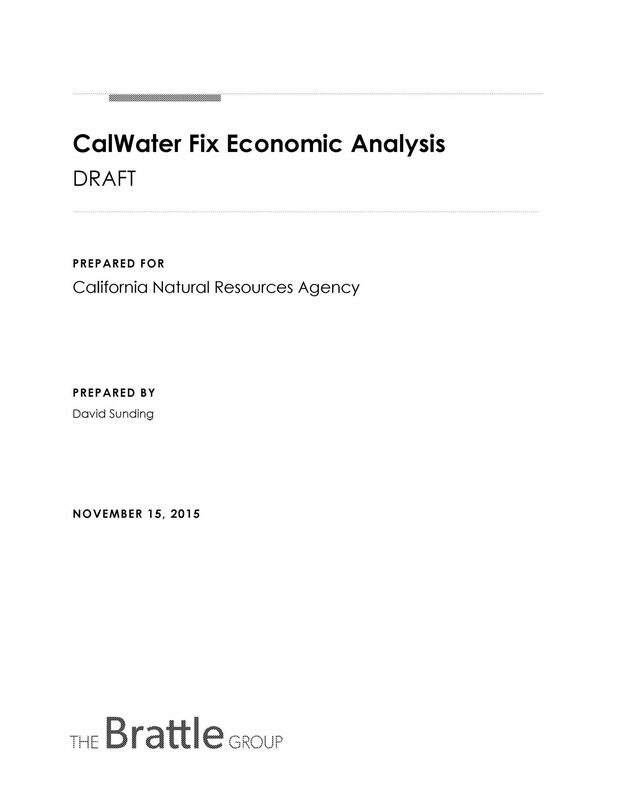 This benefit - cost analysis of the California Water Fix project was produced by Dr. David Sunding with the Brattle Group and a consultant to the Natural Resources Agency, a proponent of the project. There are two basic questions with respect to the economics of the Cal Water Fix. First, is the project affordable? That is, do the water users who would pay for the construction and operation of the tunnels have the ability to repay the associated debt and operating costs? Second, does investment in the Cal Water Fix generate benefits to water users that are greater than the costs? This is the classic benefit-cost question, and it is often a more exacting test than ability to pay. The purpose of this report is to examine the relative direct benefits and costs of the Water Fix, and to outline some of the major indirect economic effects of implementing the program. The benefits of the tunnel are analyzed with respect to a no-tunnel baseline with the same operating criteria as the Water Fix. On August 22 and September 11, 2007, the CALFED Science Program convened workshops to identify and discuss key scientific and technical issues pertaining to conveyance of Sacramento River water through or around the California Delta to the state and federal water project export pumps in the south Delta. The first workshop focused on “isolated” conveyance facilities (such as a peripheral canal or pipeline) while the second workshop focused on through-Delta conveyance facilities (such as existing or proposed through-Delta natural or man-made channels, canals, or sloughs) to convey water. During the series of presentations and discussions by subject-matter experts, several important broad conclusions emerged and are discussed below. The two workshop summaries are attached to this synthesis of key points. Over the past 40 years, state, federal, and local agencies, as well as academics have conducted numerous studies about the best way to move water through or around the Delta. 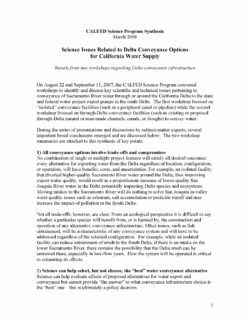 For this summary report, CALFED staff reviewed more than 100 reports — 30 of which specifically focused on various conveyance options—that dealt with Delta water conveyance and potential effects on water quality and ecosystem health and resilience. Based on a review of these reports, it appears that most focus on the amount of water than can be moved and for what cost, but little work has been done to evaluate the effects on the Delta environment or the impacts of climate change and sea level rise. We note, however, that several studies now underway are addressing these issues. 1. The operational criteria of a conveyance system is critical to determining if it will meet the environmental, water quality, and water supply reliability needs of the state. 2. 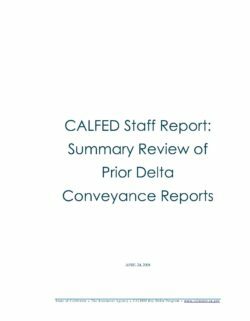 Based on the reports we reviewed, none of the conveyance options stand out as a clear choice capable of fully meeting all the performance standards laid out by the Task Force. Some conveyance options do well in some areas, but not in others; some conveyance options do moderately well across all areas. 3. Few of the existing reports include operational criteria or specifically integrate much of the new and relevant scientific data about the Delta ecosystem. 4. Cost estimates developed were for the conceptual designs for particular studies. Most of the reports did not include cost estimates for operation, maintenance and mitigation. Cost estimates presented here are not current and are not comparable among reports. 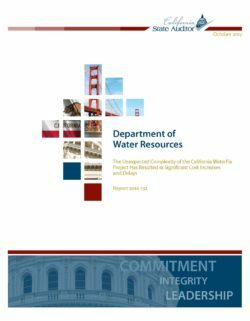 As requested by the Joint Legislative Audit Committee, the California State Auditor presents this audit report concerning the Department of Water Resources’ (DWR) management of the planning efforts for the California WaterFix Project (WaterFix). WaterFix is intended to address environmental and water supply reliability issues related to pumping water from the Sacramento?San Joaquin Delta (the Delta). Planning began in 2006 on the development of the Bay Delta Conservation Plan (BDCP), which consisted of several measures or activities for restoring the Delta and improving water reliability. Subsequently, in 2008 DWR initiated the Delta Habitat Conservation and Conveyance Program (conservation and conveyance program) to evaluate how to implement the BDCP and alternatives to it, including evaluating the environmental impacts and completing preliminary engineering work. Through the evaluation effort, DWR identified one of the alternatives—WaterFix—as its preferred approach. This report concludes that the planning phase experienced significant cost increases and schedule delays because of the scale and unexpected complexity of the project. For example, costs of the conservation and conveyance program’s efforts to evaluate and plan for the potential implementation of the BDCP and its alternatives, which eventually included WaterFix, increased significantly. As of June 2017, the planning costs had reached $280 million. We also found that DWR did not follow state law when it replaced the program manager for the conservation and conveyance program. Specifically, DWR selected the Hallmark Group (Hallmark) to provide program management services without advertising a request for qualifications, and DWR could not demonstrate that it ever evaluated Hallmark’s qualifications for this role. The cost of DWR’s current contract with Hallmark has tripled from $4.1 million to $13.8 million. Additionally, DWR has not completed either an economic or financial analysis to demonstrate the financial viability of WaterFix. Finally, it has not fully implemented a governance structure for the design and construction phase, and has not maintained important program management documents for WaterFix. Water management in California has always been challenging. The state’s variable climate is marked by long droughts and severe floods, with stark regional differences in water availability and demand. 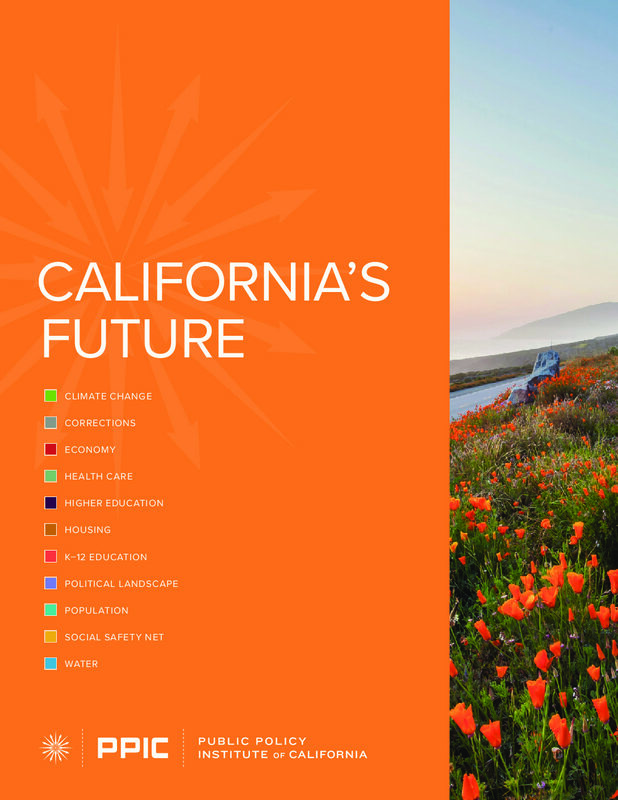 California has adapted by building a vast network of storage and conveyance facilities to deliver water from the wetter parts of the state to population and farming centers in the Bay Area, the San Joaquin Valley, and Southern California. The Sacramento–San Joaquin Delta is a fragile link in the state’s water supply network, and a plan to address supply reliability, known as California WaterFix, faces many hurdles. California’s extensive network of dams is aging. Agricultural demand is becoming less flexible, as farmers are increasing tree crops (especially nuts), which must be watered every year. Conflicts are growing between human water use and water needed to support fish and other wildlife. And the latest cycle of droughts and floods provides a glimpse of an uncertain future under climate change. 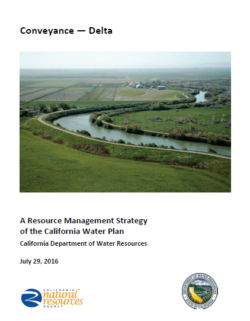 California’s water management challenges are complex, but they can be addressed. Solutions will involve difficult and sometimes costly trade-offs, as well as contentious legal and political changes. The Sacramento-San Joaquin Delta (Delta) is the confluence point of the Sacramento and San Joaquin rivers as water is naturally conveyed westward from upstream water basins to the bays connected to the Pacific Ocean (Figure 1). In its natural state, the Delta was a vast marsh and floodplain dissected by meandering channels and sloughs. Even in today’s highly altered environment, the Delta remains a critical ecosystem and dynamic habitat that is home to hundreds of aquatic and terrestrial species, including many species endemic to the area and a number that are designated as threatened or endangered by the federal Endangered Species Act (ESA) and California Endangered Species Act (CESA). The Delta is also a centerpiece of California’s water system. The conveyance of water through the Delta supplies water for more than 25 million Californians. The water conveyed through the Delta also supports farms and ranches stretching from the north Delta to California-Mexico border, which collectively produce nearly half of the nation’s domestically grown fresh produce and supports a $27 billion agricultural industry. In addition to being a key agricultural region itself and recreational destination, the Delta supports extensive infrastructure of statewide importance, such as aqueducts, natural gas pipelines, electricity transmission lines, railroads, shipping channels, and highways. The Sacramento-San Joaquin River Delta is in crisis. It is not alarmist to state that the Delta-wide ecosystem—and, by extension, San Francisco Bay is in collapse and that its damaged condition may spell doom for many important species and habitats. Scientific evidence has shown that the Delta is starving for freshwater, with repercussions for the entire estuary. While there are no quick or easy solutions to increase freshwater flows, what is clear is that the Governor’s current proposal, known as WaterFix, would authorize further water diversions from this already crippled system without first establishing a path to recovery and sustainability. WaterFix proposes to build large tunnels to take more freshwater from the Delta without substantially addressing the urgent environmental issues facing these river systems. The tunnels would harm the rivers, harm the Delta, and harm San Francisco Bay.